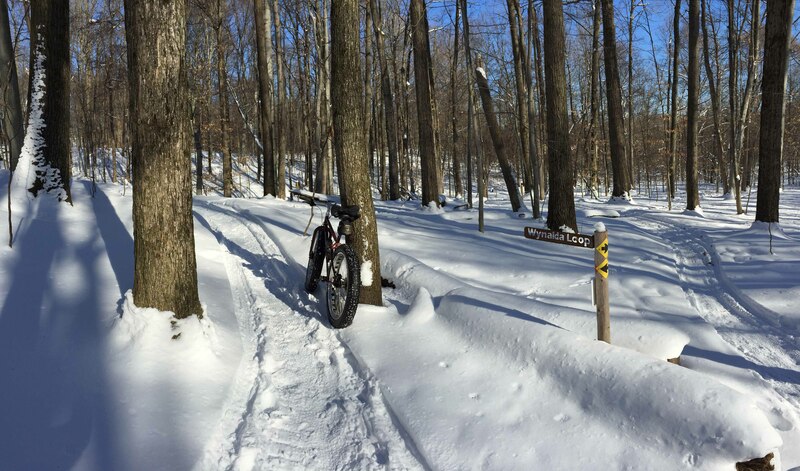 Winter beauty is found on groomed snow-bike trails like this loop at Merrell Trail in Rockford, MI. Photo: Kevin Allen. GRAND RAPIDS, MI – When fat-tire bikes first made an appearance in Michigan a few years ago, many dedicated riders considered them a fad — a puffed-up version of a mountain bike with big, soft tires that enabled them to be ridden on beaches and by hard-core riders in snowy conditions. Few thought much would come of it. But fat-tire bikes, also known as fat bikes, increasingly are being embraced by the cycling community, and groomed winter cycling trails have proliferated around the state to accommodate them. The trails are being developed by ski areas, municipalities and mountain biking and other groups. Brent Walk, of Grand Rapids, has been a cycling race promoter for 28 years. His company, funpromotions.com, is on its third year of hosting winter fat bike races around the state. Traverse City is one example. 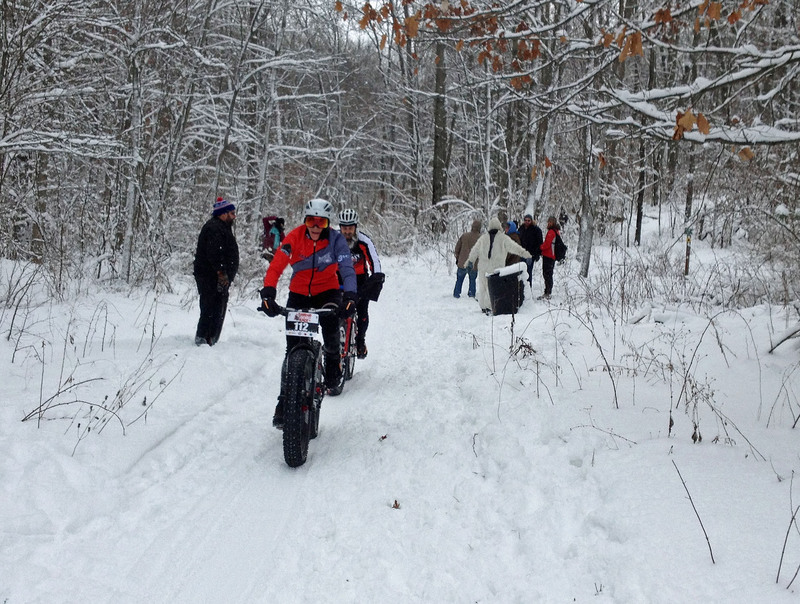 It sports a 15K (9-mile) groomed Winter Sports Singletrack trail for fat-tire bikes. The trail, which opened this season, was created by the Northern Michigan Mountain Biking Association which also grooms and maintains it, working in cooperation with the Traverse Area Recreation and Transportation Trails Inc., the nonprofit group that manages the Vasa trail. Winter cyclists get out during the Farmers Farmhand Race at Cannonsburg Ski Area. Photo: Kevin Allen. Hanson Hills Recreation Area in Grayling, is another. It developed a 5-mile groomed winter bike trail. Crystal Mountain ski resort, in Thompsonville, said earlier this winter it now has six miles of groomed snow bike trails along with bike rentals. The big dog is the Noquemanon Trail Network, in Marquette, run by a nonprofit with the same name. Farther south, there are other groomed trails. Cannonsburg Ski Area, just east of Grand Rapids, now grooms 4.5 miles of bike trail. The city of Grand Rapids also is experimenting with it at Indian Trails Golf Course, 2776 Kalamazoo Ave SE. Grand Rapids teamed up with Central District Cyclery, which demonstrates snow bikes Wednesdays at 5 p.m. People can show up with their own, too. There is a $5 trail fee. Three miles of trail are being groomed, said Lance Climie, the golf course manager. 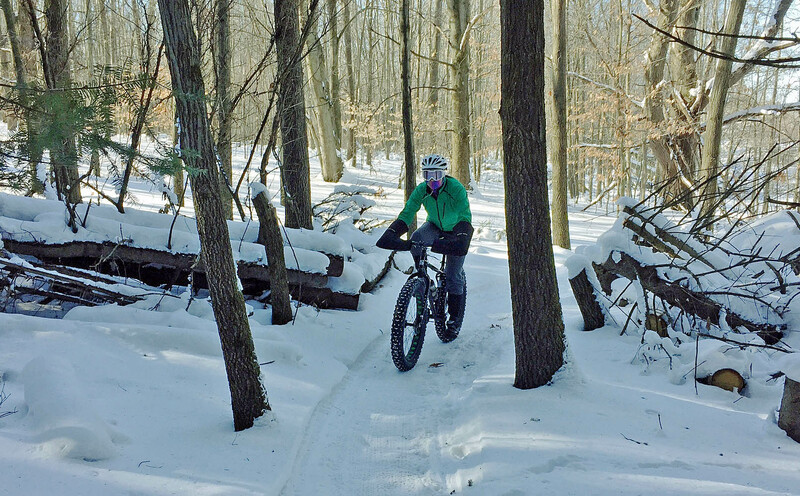 Ruth Allen takes a spin on the groomed Merrell Trail in Rockford, MI. Photo: Kevin Allen. Bill Hoyer is one of those riders who caught the snow bike wave. The 54-year-old Wayland resident and president of Precision Aerospace Corp., in Grand Rapids, bought a fat-trail bike last August. He was a dedicated mountain biker until then. “I am riding my fat bike more than my Niner (mountain bike),” Hoyer said. “I’ve ridden year-round, when possible, and have encountered precarious situations on a mountain bike, on ice and not getting through deeper snow. Hoyer rides once a week in winter at the groomed Merrell Trail in Rockford, one of two west Michigan trails, including the Deep Lake Trail at Yankee Springs, being maintained for winter bikes by the West Michigan Mountain Biking Alliance. Each offers approximately 5 miles of groomed trail. Grooming is important, according to cycling enthusiasts. Despite their wide tires and shock-absorbers, fat-tire bikes can — and do — get bogged down in deep snow. That means having to carry a bike to trail’s end. Grooming packs the snow and creates a rideable base. “Five years ago, they had the nickname: ‘fad bike,’” said Kevin Allen, president of the West Michigan Mountain Biking Alliance. “People thought they would come and go. But, those folks were wrong. “More and more people are picking up fat bikes these days. With the new tire designs and suspensions, they ride more like a mountain bike than a fat bike. They have a nice geometry for trails or snow. This entry was posted in Uncategorized and tagged Adventure Travel, bicycles, Bike Trails, Cycling, Fat Bikes, Mountain Bikes, Trails. Bookmark the permalink.